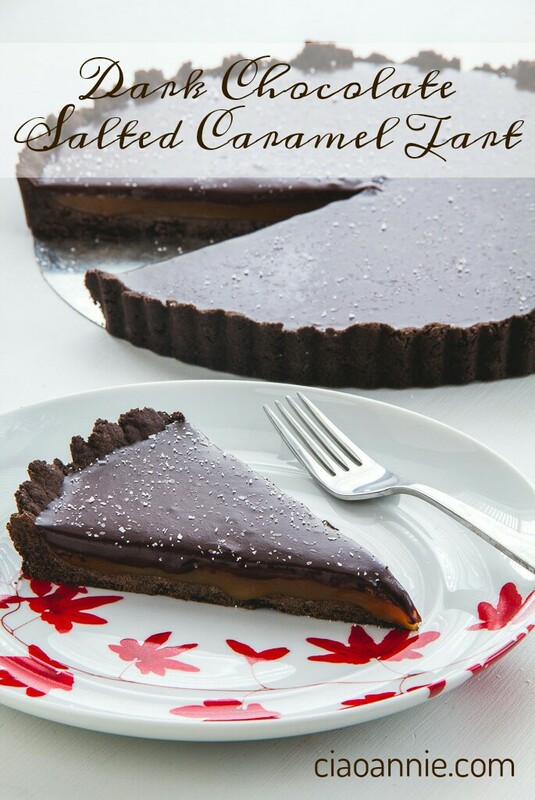 This dark chocolate salted caramel tart screams Happy Valentine’s Day, at least for me. While my husband doesn’t eat chocolate, I haven’t had trouble sharing this tasty treat with the other Valentines in my life. Seriously… this is a crunchy chocolate crust, filled with an ooey gooey sweet caramel, topped with a slightly bitter chocolate ganache and dusted with salt. Amazing. There are several steps to this recipe, which each require cool time, but it is definitely worth the effort! Read through the entire recipe to make certain you have plenty of time prior to serving. While the cool times may be several hours, each step only takes a few minutes to complete. Try this… your loved ones will thank you! In a medium mixing bowl, cream the butter and powdered sugar until light and fluffy, about 3 minutes. Mix in the egg yolks and vanilla and beat until fully incorporated. Add the cocoa powder, flour and flake salt and beat on low speed until combined. Press the crust evenly in the bottom and up the side of a 9 inch tart pan with a removable bottom. Chill the unbaked dough in the refrigerator for 20-30 minutes, depending on your patience. Use a fork and poke the bottom of the crust. Bake the chilled crust for 15 minutes and let cool. In a medium saucepan, over medium high heat, stir together sugar, water, corn syrup and salt. Bring the mixture to a boil and continue heat, without stirring, until the mixture turns golden brown and a candy thermometer reads 350 degrees. Make sure the candy thermometer does not sit on the bottom or side of the pan. Quickly stir in the cream and salted butter. Pour the caramel into the chocolate crust and chill in the refrigerator for at least 2-3 hours. In a small saucepan, bring the cream to a simmer. As soon as the cream begins to simmer, remove from the heat, and pour over the chopped chocolate in a small bowl. Allow the cream to melt the chocolate and stir the mixture until smooth and creamy. Pour the chocolate ganache over the chilled caramel. Let the tart cool until the chocolate sets. Dust the tart with kosher flake salt and serve slightly chilled. Oh Emm Gee! The Wife Unit and I recently experienced this salted dream from the Cavedine kitchen. It is wonderful and was even more so with the accompanying caramel ice cream.